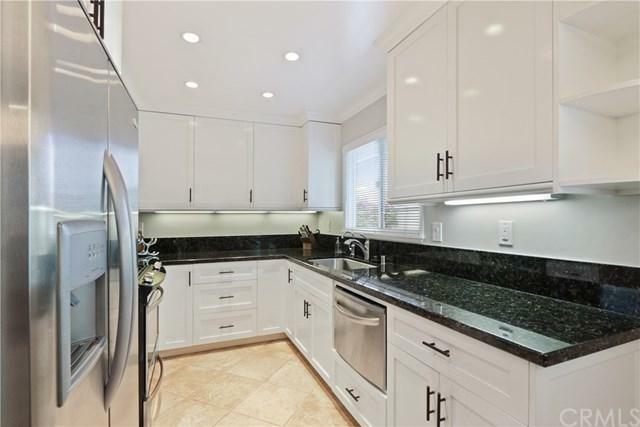 Remodeled, single story, end unit, high end finishes and the feel of a single family residence. 2 masters, 2 baths, 1 car detached garage, laundry room, private and quiet back yard! Walls removed to open up kitchen to living area gives a spacious feel. Kitchen remodeled with high-end cabinetry, stainless steel appliances, gas stove, granite counter tops, & large pantry w/storage. 2 master en-suites w/walk-in closets & bathrooms. Bathrooms remodeled; 1 bathroom w/bench in shower, other bathroom w/vessel sink & tub enclosed with glass shower doors. Gas fireplace in living room, ceiling fans in bedrooms, reading lights, travertine tile throughout home, new baseboards & moldings. Newer windows, newer doors, recessed lighting, LED under-counter lights in kitchen. Natural light & cross-breezes flow throughout the home. Laundry room with stacked washer & dryer. Must see back and side yards! One of the largest in the complex w/shade structure & sunny areas to relax amongst fruit trees & plants. The yard has alley access to 17th street shops. The complex has an HOA pool, jacuzzi & club house surrounded by grassy areas & walking paths. Located in highly sought after Eastside Costa Mesa, with top schools Mariners Elementary School and Newport Harbor High School. Walking distance to library, parks, shops and restaurants, close to beach & freeways. Don't miss out! A very quiet location and special home. Sold by Maureen Mulligan of Realty Source, Inc.